This paper presents a new framework for adding semantics into e-learning system. The proposed approach relies on two principles. The first principle is the automatic addition of semantic information when creating the mathematical contents. The second principle is the collaborative tagging and annotation of the e-learning contents and the use of an ontology to categorize the e-learning contents. 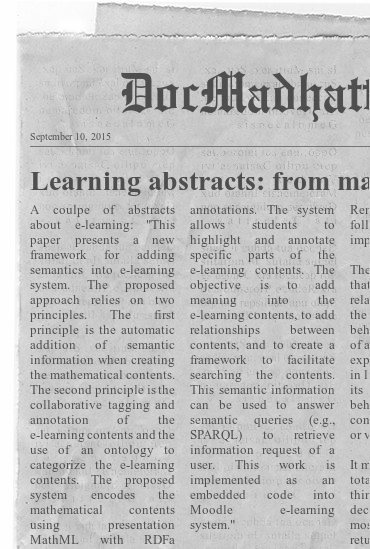 The proposed system encodes the mathematical contents using presentation MathML with RDFa annotations. The system allows students to highlight and annotate specific parts of the e-learning contents. The objective is to add meaning into the e-learning contents, to add relationships between contents, and to create a framework to facilitate searching the contents. This semantic information can be used to answer semantic queries (e.g., SPARQL) to retrieve information request of a user. This work is implemented as an embedded code into Moodle e-learning system. As far as Learning Management System is concerned, it offers an integrated platform for educational materials, distribution and management of learning as well as accessibility by a range of users including teachers, learners and content makers especially for distance learning. Usability evaluation is considered as one approach to assess the efficiency of e-Learning systems. It is used to evaluate how well technology and tools are working for users. There are some factors contributing as major reason why LMS is not used effectively and regularly. Learning Management Systems, as major part of e-Learning systems, can benefit from usability research to evaluate the LMS ease of use and satisfaction among its handlers. Many academic institutions worldwide prefer using their own customized Learning Management Systems; this is the case with Moodle, an open source Learning Management Systems platform designed and operated by most of the universities in Sri Lanka. This paper gives an overview of Learning Management Systems used in Sri Lankan universities, and evaluates its usability using some pre-defined usability standards. In addition it measures the effectiveness of Learning Management System by testing the Learning Management Systems. The findings and result of this study as well as the testing are discussed and presented. We propose Neural Transformation Machine (NTram), a novel architecture for sequence-to-sequence learning, which performs the task through a series of nonlinear transformations from the representation of the input sequence (e.g., a Chinese sentence) to the final output sequence (e.g., translation to English). Inspired by the recent Neural Turing Machines , we store the intermediate representations in stacked layers of memories, and use read-write operations on the memories to realize the nonlinear transformations of those representations. Those transformations are designed in advance but the parameters are learned from data. Through layer-by-layer transformations, NTram can model complicated relations necessary for applications such as machine translation between distant languages. The architecture can be trained with normal back-propagation on parallel texts, and the learning can be easily scaled up to a large corpus. NTram is broad enough to subsume the state-of-the-art neural translation model in  as its special case, while significantly improves upon the model with its deeper architecture. Remarkably, NTram, being purely neural network-based, can achieve performance comparable to the traditional phrase-based machine translation system (Moses) with a small vocabulary and a modest parameter size. Hints of physics behind standard model?